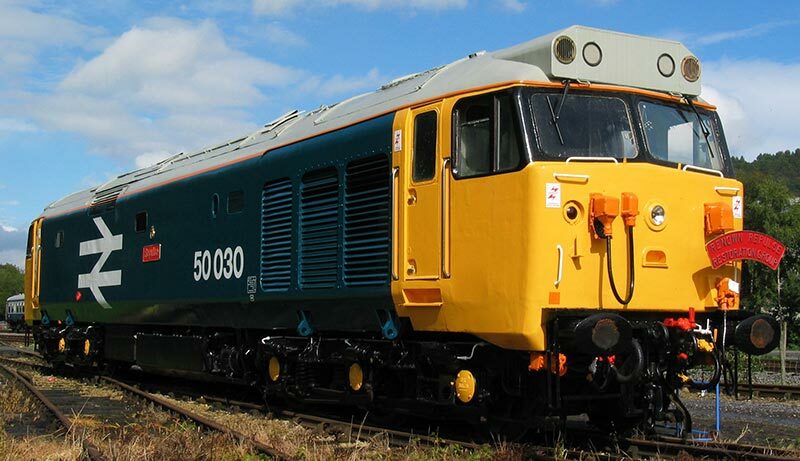 Renown Repulse Restoration Group was formed in 2002. with the core aim, to restore, operate and exhibit for the benefit of the public, the two ex-British Rail Class 50 locomotives 50029 Renown and 50030 Repulse. It had been feared in enthusiast circles for some years around this time that the Operation Collingwood project to restore various ex-British Rail class 50 locomotives was failing and that their assets might end up being scrapped. Operation Collingwood’s fleet consisted of no’s 50001/23/29/30/40/45 with most of these being heavily stripped ex-scrapyard examples. The best condition locomotives were 50029 Renown and 50030 Repulse which had never been in a scrapyard and were worth saving for restoration. RRRG was formed following discussions between enthusiasts on an internet forum and in summer 2002 were advised that their bid for Operation Collingwood’s remaining assets (50029, 50030 and a number of spares) had been successful. Whilst they knew it wouldn’t be an easy task, they were heartened by the fact that 50030 was substantially complete with only a few missing parts, mainly electrical whereas 50029 was less complete but still had all major components present. Rowsley South site is the base for the Group’s restoration project and further information can be found on their website at www.renownrepulse.com.